The domain within your query sequence starts at position 90 and ends at position 278; the E-value for the TBOX domain shown below is 1.79e-128. Transcription factors of the T-box family are required both for early cell-fate decisions, such as those necessary for formation of the basic vertebrate body plan, and for differentiation and organogenesis [(PUBMED:12093383)]. 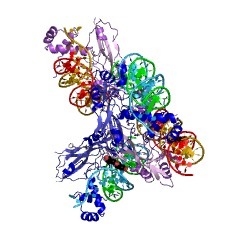 The T-box is defined as the minimal region within the T-box protein that is both necessary and sufficient for sequence-specific DNA binding, all members of the family so far examined bind to the DNA consensus sequence TCACACCT. 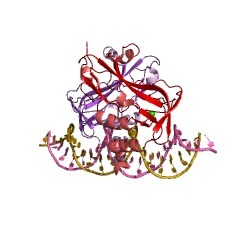 The T-box is a relatively large DNA-binding domain, generally comprising about a third of the entire protein (17-26 kDa) [(PUBMED:9349824)]. These genes were uncovered on the basis of similarity to the DNA binding domain [(PUBMED:9504043)] of Mus musculus (Mouse) Brachyury (T) gene product, which similarity is the defining feature of the family. The Brachyury gene is named for its phenotype, which was identified 70 years ago as a mutant mouse strain with a short blunted tail. The gene, and its paralogues, have become a well-studied model for the family, and hence much of what is known about the T-box family is derived from the murine Brachyury gene. 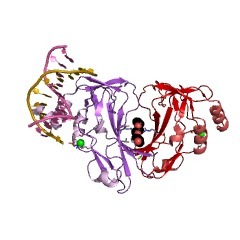 Consistent with its nuclear location, Brachyury protein has a sequence-specific DNA-binding activity and can act as a transcriptional regulator [(PUBMED:9503012)]. Homozygous mutants for the gene undergo extensive developmental anomalies, thus rendering the mutation lethal [(PUBMED:9395282)]. The postulated role of Brachyury is as a transcription factor, regulating the specification and differentiation of posterior mesoderm during gastrulation in a dose-dependent manner [(PUBMED:9504043)]. 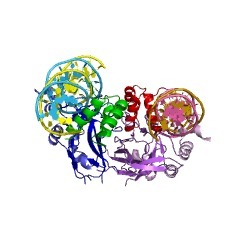 T-box proteins tend to be expressed in specific organs or cell types, especially during development, and they are generally required for the development of those tissues, for example, Brachyury is expressed in posterior mesoderm and in the developing notochord, and it is required for the formation of these cells in mice [(PUBMED:9196325)]. The T-box family is an ancient group that appears to play a critical role in development in all animal species [(PUBMED:7920656)]. There are 8800 TBOX domains in 8777 proteins in SMART's nrdb database. Taxonomic distribution of proteins containing TBOX domain. This tree includes only several representative species. The complete taxonomic breakdown of all proteins with TBOX domain is also avaliable. Click on the protein counts, or double click on taxonomic names to display all proteins containing TBOX domain in the selected taxonomic class. Regulation of gene expression at the beginning of mammalian development and the TEAD family of transcription factors. In mouse development, transcription is first detected in late 1-cell embryos, but translation of newly synthesized transcripts does not begin until the 2-cell stage. Thus, the onset of zygotic gene expression (ZGE) is regulated at the level of both transcription and translation. Chromatin-mediated repression is established after formation of a 2-cell embryo, concurrent with the developmental acquisition of enhancer function. The most effective enhancer in cleavage stage mouse embryos depends on DNA binding sites for TEF-1, the prototype for a family of transcription factors that share the same TEA DNA binding domain. Mice contain at least four, and perhaps five, genes with the same TEA DNA binding domain (mTEAD genes). Since mTEAD-2 is the only one expressed during the first 7 days of mouse development, it is most likely responsible for the TEAD transcription factor activity that first appears at the beginning of ZGE. All four mTEAD genes are expressed at later embryonic stages and in adult tissues; virtually every tissue expresses at least one family member, consistent with a critical role for TEAD proteins in either cell proliferation or differentiation. 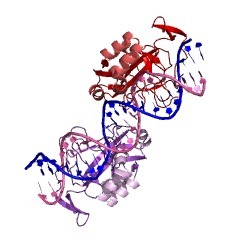 The 72-amino acid TEA DNA binding domains in mTEAD-2, 3, and 4 are approximately 99% homologous to the same domain in mTEAD-1, and all four proteins bind specifically to the same DNA sequences in vitro with a Kd value of 16-38 nM DNA. Since TEAD proteins appear to be involved in both activation and repression of different genes and do not appear to be functionally redundant, differential activity of TEAD proteins must result either from association with other proteins or from differential sensitivity to chromatin-packaged DNA binding sites. A novel family of transcription factors that appears to play a critical role in the development of all animal species was recently uncovered on the basis of homology of the DNA binding domain of the Brachyury, or T locus, gene product. Phylogenetic studies have shown the ancient origin of this gene family, which has been named the T-box family, prior to the divergence of metazoa from a common ancestral type. T-box genes have now been identified in the genomes of C. elegans, Drosophila, sea urchin, ascidian, amphioxus, Xenopus, chick, zebrafish, mouse, and human and will probably be found in the genomes of all animals. Although functional analyses of T-box family members have just begun, the results show a wide range of roles in developmental processes that extend over time from the unfertilized egg through organogenesis. Only a few mutations in T-box genes are known, but all have drastic effects on development, including a targeted mutation in mice causing an embryonic lethal phenotype, and two human T-box gene mutations that results in developmental syndromes. This review presents a current overview of progress made in the analysis of T-box genes and their products in a variety of model systems. 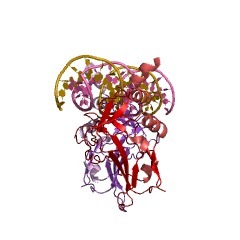 Crystallographic structure of the T domain-DNA complex of the Brachyury transcription factor. The mouse Brachyury (T) gene is the prototype of a growing family of so-called T-box genes which encode transcriptional regulators and have been identified in a variety of invertebrates and vertebrates, including humans. Mutations in Brachyury and other T-box genes result in drastic embryonic phenotypes, indicating that T-box gene products are essential in tissue specification, morphogenesis and organogenesis. 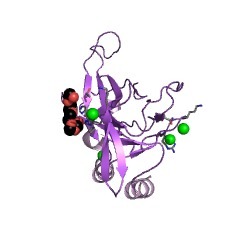 The T-box encodes a DNA-binding domain of about 180 amino-acid residues, the T domain. Here we report the X-ray structure of the T domain from Xenopus laevis in complex with a 24-nucleotide palindromic DNA duplex. We show that the protein is bound as a dimer, interacting with the major and the minor grooves of the DNA. A new type of specific DNA contact is seen, in which a carboxy-terminal helix is deeply embedded into an enlarged minor groove without bending the DNA. Hydrophobic interactions and an unusual main-chain carbonyl contact to a guanine account for sequence-specific recognition in the minor groove by this helix. Thus the structure of this T domain complex with DNA reveals a new way in which a protein can recognize DNA. An ancient family of embryonically expressed mouse genes sharing a conserved protein motif with the T locus. The T locus encodes a product with DNA binding activity that is likely to play a role in the development of all vertebrate organisms. We have identified and characterized a novel family of mouse genes that share a protein motif, the T-box, with the prototypical T locus. The T-box domain of the T locus co-localizes with its DNA binding activity. Each T-box gene is expressed in a unique temporal and spatial pattern during embryogenesis. Phylogenetic analysis suggests that at least three T-box genes were present in the common ancestor to vertebrates and invertebrates. Thus, members of the T-box family could have played a role in the evolution of all metazoan organisms. 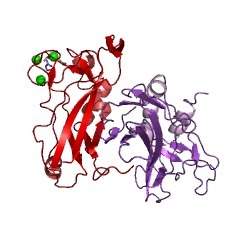 SwissProt sequences and OMIM curated human diseases associated with missense mutations within the TBOX domain. 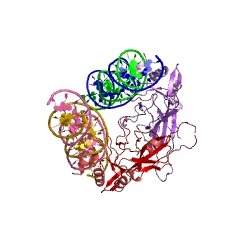 4a04 Structure of the DNA-bound T-box domain of human TBX1, a transcription factor associated with the DiGeorge syndrome.